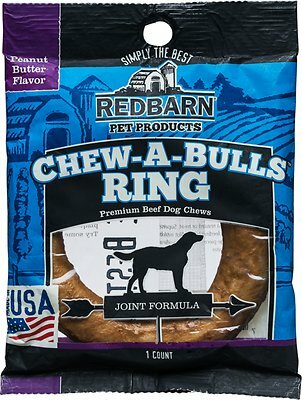 Show your loyal pup some love with a delicious, everlasting Redbarn Peanut Butter Flavor Joint Formula Chew-A-Bulls Ring Dog Treat. 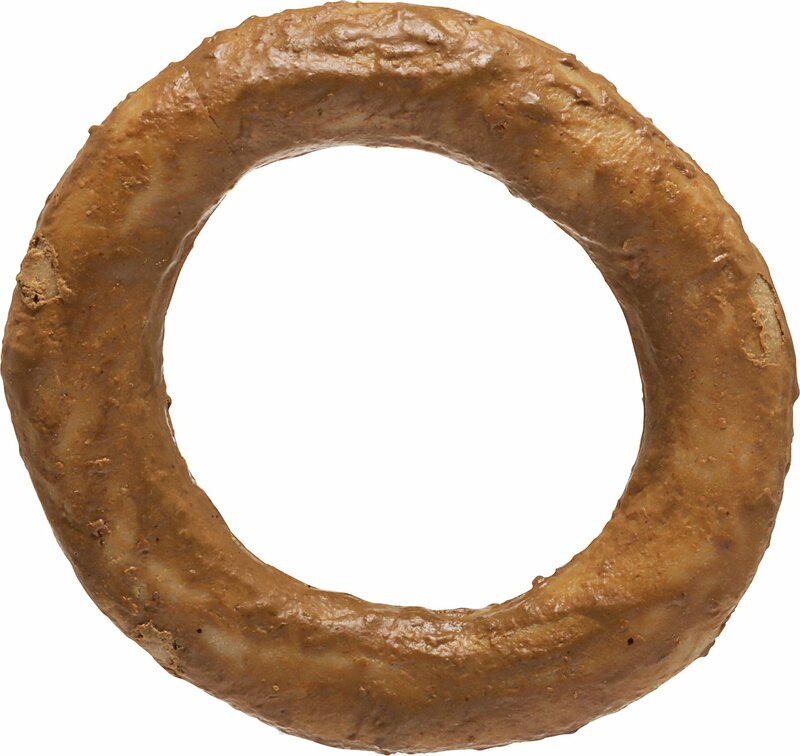 Guaranteed to keep your little buddy busy, this bully chew packs irresistible peanut butter flavor into a thick ring shape that he’ll never want to stop gnawing. This tasty treat supports joint health and mobility with chicken cartilage, a natural source of glucosamine and chondroitin. 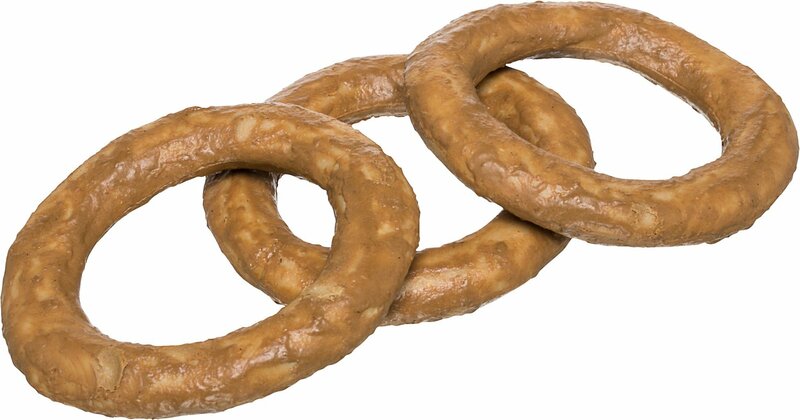 Potato Starch, Chicken Liver and Hearts, Egg, Vegetable Glycerin, Food Starch, Chicken Meal, Cellulose, Sorbitol, Chicken Broth, Beef Pizzle, Peanut Butter (Peanuts, Dextrose, Vegetable Oil, Salt), Lecithin, Potassium Sorbate (a Preservative), Sodium Bicarbonate, Peanut Butter Flavor, Titanium Dioxide Color, Caramel Color, Chicken Cartilage, Salmon Oil, Ascorbic Acid (Source of Vitamin C), Vitamin E Supplement, Yellow 6, Dried Blueberries, Dried Cranberries. I love that I can get these treats for our dog delivered right to our door! 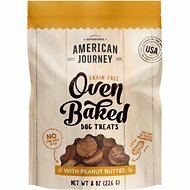 Our vet totally approves of the ingredients and our dog runs in circles when she hears the wrapper ! My pup, London Severus, loved this treat!! He treasured it until he nibbled it up- and it was gone!! 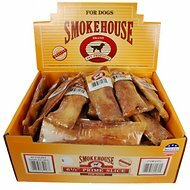 My dog loves these more than any other treat. They are soft and keep him busy with no mess or weird smell. It's easy on the stomach and he loves the flavor. My dog Bandit sat on the couch and slowly spun it in circles eating all of the topping off it and then he went to town eating the rest of it. 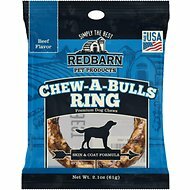 I bought these chews after I read the reviews. It did not last but 6 minutes and I think it gave my boxer the runs. My friend who buys the Pork Chomps gave me one that her boxer loves. My girl loved it and the Chomp lasted 25 minutes and her tummy was fine. I'll be buying those for my puppy. Meh...expensive for how short it lasts,,less than 5 min. My GSD really enjoyed it tho. doesn’t last long but our dog loves them! The dog finished it within 10 minutes but it’s worth it because he truly enjoys these so much. My Golden-Doodle loved this. He is getting picky with his treats lately, but not these. He immediately accepted this treat with no hesitation, and finished the whole thing. I gave one to my big dog and she inhaled it! The little dog worked on it for a few minutes and it was gone! They must be very yummy! !